WOW!!! that is amazing! 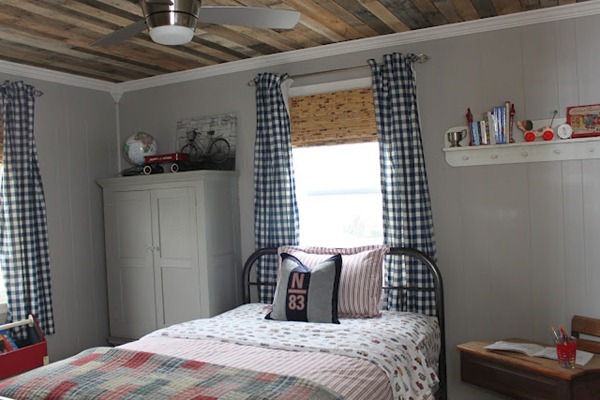 i love the entire room, but that ceiling…. whoa! awesome job! Wow! They did a great job. Some serious work went into that project. It looks beautiful though! this is super, super cool! great reno! Great rustic and unique look. I wonder how difficult it was for the fan to go up with the extra layer of ceiling around the electrical box. Very cool though and I love the decor chosen to accent and bring it all out. It actually wasn’t that hard. I just had to use long enough screws to mount it to the ceiling box. The other thing was we made sure the thickness of the pallet wood around the fan was exactly the same width so the fan would be level when I secured it to the ceiling. this is awesome! y’all did a great job! love the look! Having worked in several warehouses in my past, I would not take pallet wood to make anything I put in my house, much less a kids room. I’ve seen some pretty nasty chemicals leech into pallets. Even if you get the pallets from a known source that doesn’t use nasty chemicals, pallets get recycled all the time, so you can never be sure unless your getting them from the original source, but then on course they wouldn’t look rustic either, unless you aged them yourself. Very cool and creative, I love this idea, and would love to also try it, how long did it take you to do all this? Thanks for the great idea. We’ve been trying to figure out how to do our ceiling rustic and affordable. The pallet idea is wonderful It’s exactly the look we wanted and I love the price……free! All of our trim is rough cedar, but that would be way to expensive to do the ceiling since we have to cover popcorn ceiling in a great room. Thanks again. We will send photos!!! Yay! I can’t wait to see how it turns out! You did an awesome job! I am in the middle of doing my living room ceiling with boards. Can’t wait until it’s finished. Thank you so much for providing a tutorial with your photo’s! We are making a mason jar light fixture for a farm house themed kitchen and this pallet ceiling will be perfect with it! Our old plaster ceiling fell last year, so we have an ugly, unfinished drywall ceiling to mount them too!! This is so neat! I have a room with that exact ceiling tile and it’s awful! I’m very tempted to show this post to my husband and plead for a new ceiling! Love it! Yeah, whatever. Nice ceiling, Adolph. Just kidding. Really. Nice ceiling, Adolph. Oh my Gosh – WHERE can I do this – LOVE it so much ! What a beautiful job you guys did – just to let you know here in Montreal you can take as many pallets as you want for free from Home Depot! Hi Rob, this is a post from a guest so I can’t answer your question, but if you’ll head over to their blog (linked up toward the top of the post) then they can help! Thanks!